This gummy bug cake is probably my new favorite thing. (Until the next cake. ?) I’ve been kicking around the idea of a cool bug cake in my head for a while now. 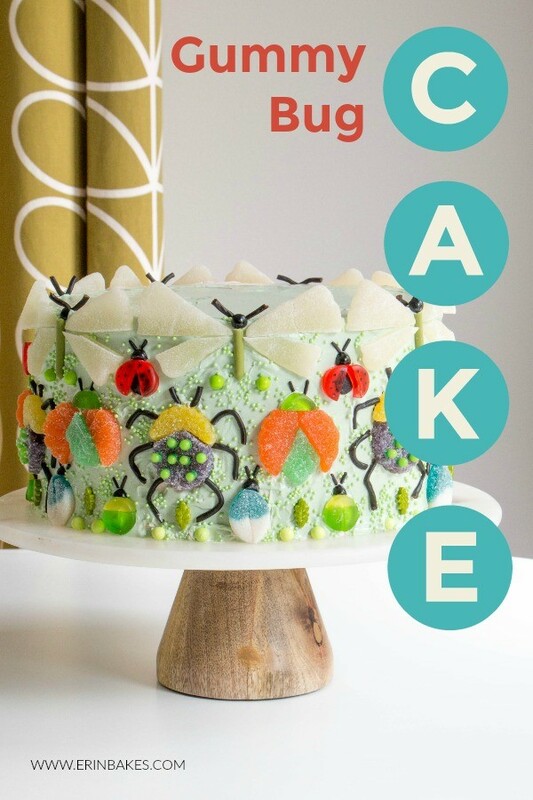 Bug themed cakes are often cutesy or gross and geared toward little kids, but insects can be stunning. I love those old scientific prints with rows and rows of colorful bugs. If money were no object, I’d be inclined to wear some giant gem encrusted bugs from Tiffany or something. I’m going on the record to say that bugs are chic. Chic AF. Staying true to my style, I considered all of my go-to cake decorating mediums – cookies, chocolate, and candy. Candy fit the bill perfectly. Gummy candies already come in every color imaginable. They’re easy to cut and stick back together, and they’re a whole lot of fun to eat! From a practical standpoint this cake would be perfect as a birthday cake for cool kids of any age. These sweet little creatures would also make adorable cupcake toppers. If you can’t find the exact candies that I used, just wing it. (ba dum, ching) Be creative with whatever you can find near you! I used an 8″ round layer cake finished in pale green buttercream, but you can use whatever size fits your needs. Cut all of your gummy bug pieces up before assembling them on the cake. Lightly grease the blade of your knife or scissors with shortening or pan spray to prevent the candy from sticking. Snap off a 1-inch piece of Pocky for the dragonfly’s body. Cut a gummy grapefruit slice leaving a small piece (about 1/3 of the candy) and one larger piece (the remaining 2/3). Repeat with another gummy grapefruit slice. Cut the pointed end of each small wing at an angle. Trim the domed end of a black jelly bean for the dragonfly’s head. Cut a 1 1/2-inch piece of black licorice rope. Cut a gummy mint leaf through the middle and discard the back of the candy. Trim off the top of the leaf on both sides at an angle. Cut two gummy orange slices through the middle and discard the backs. Trim the long edges of the slices flat and cut away one of the tips of each slice. Press the cut edges of the orange slices onto the cut sides of the mint leaf. Trim the top of the bug’s body to make a flat edge. Cut a green Haribo Roulette gummy in half and press the cut edge onto the beetle’s body to make the head. Set aside two black sprinkles for the antennae. Melt the green coating chocolate and pour it into a small piping bag or paper cone. Cut two gummy grape slices through the middle, discard the backs, then trim the long sides flat. Press the cut edges together. Cut a lemon slice through the middle and discard the back. Cut a deep V into the long side of the candy. Trim the tops of the grape candies at an angle so that the lemon one fits on top. Cut a slice of a licorice bite to make the beetle’s head. Pipe green dots onto the beetle’s body and top them with green sugar pearls. Cut 6 1-inch pieces of black licorice ropes for the beetle’s legs and two smaller pieces for the antennae. Trim the end off of a licorice bite to form the lady bug’s body. Cut a red Haribo Roulette gummy in half. Place the halves on the cut piece of licorice to make the lady bugs wings. Trim the end of a black jelly bean for the head and set aside 2 black sprinkles for antennae. Cut away 1/3 of a green Haribo Roulette gummy. Discard the small piece. Cut away 1/3 of a yellow gummy and discard the large piece. Press the small yellow and large green pieces together along the cut edges. Score a line down the middle to make it look like wings that are closed. Trim a black jelly bean to make the head and set aside 2 black sprinkles. There really is no right or wrong way to go about adding your gummy bugs to the cake. I started with the dragonflies and worked my way down. Pinch the little piece of licorice rope you cut for the dragonfly’s antennae in half and tuck it behind the jelly bean head. I found it easiest to next add the bottom row of bugs, lining up the blue bugs with the dragonflies and placing the little green and yellow beetles on either side. Fit the larger beetles underneath the dragonflies, one under each wing. Add the lady bugs between the dragonflies for little bursts of color. Toss green nonpareils onto the cake to add texture and to cover your tracks. ? Fill in spaces with green Sixlets and leaf sprinkles to create a pattern within the bugs. This cake will be a perfect one for my kid’s upcoming birthday. I am a baker and I will definitely bake this one for him. I know he will love such cake. Thanks a lot for sharing this alluring and tasty cake recipe. Yummy Cake 🙂 It is Looking for very delicious. I missed 3rd video, Could you upload it again? Oops! Thanks so much for letting me know. 🙂 Video is back up!